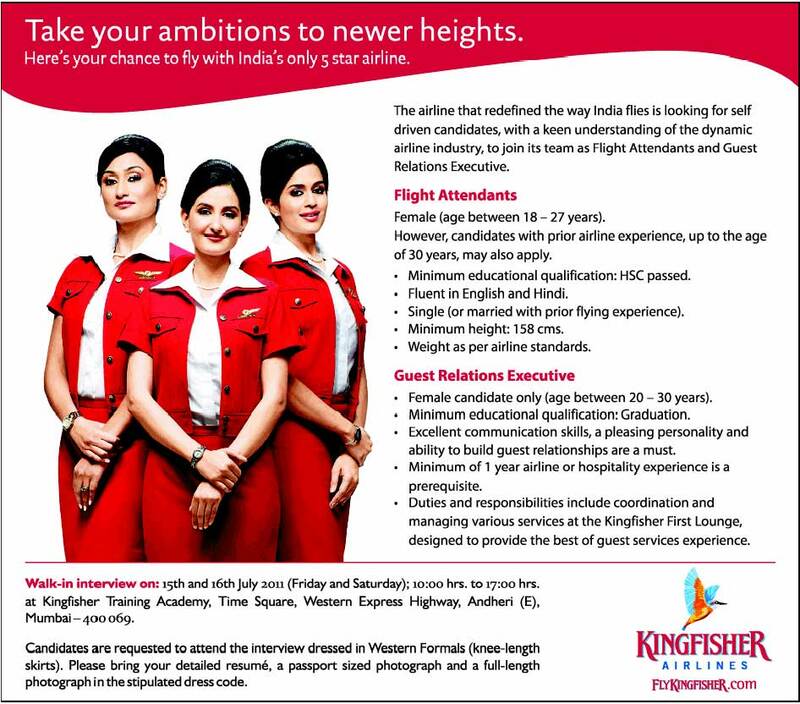 The airline that redefined the way India flies is looking for self driven candidates, with a keen understanding of the dynamic airline industry, to join its team as Flight Attendants and Guest Relations Executive. Female (age between 18-27 years). 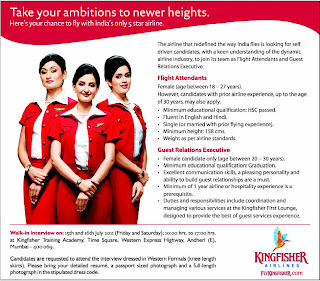 However, candidates with prior airline experience, up to the age of 30 years, may also apply. • Minimum educational qualification: HSC passed. • Fluent in English and Hindi. • Single (or married with prior flying experience). • Minimum height: 158 cms. • Weight as per airline standards. • Female candidate only (age between 20 - 30 years). • Minimum educational qualification: Graduation. • Excellent communication skills, a pleasing personality and ability to build guest relationships are a must. • Minimum of 1 year airline or hospitality experience is a prerequisite. • Duties and responsibilities include coordination and managing various services at the Kingfisher First Lounge, designed to provide the best of guest services experience. Walk-in interview on: 15th and 16th July 2011 (Friday and Saturday); 10:00 hrs. to 17:00 hrs. at Kingfisher Training Academy, Time Square, Western Express Highway, Andheri (E), Mumbai-400069. Candidates are requested to attend the interview dressed in Western Formals (knee-length skirts). Please bring your detailed resume, a passport sized photograph and a full-length photograph in the stipulated dress code.